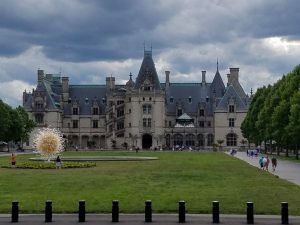 In early June, I was a member of the faculty at the North Carolina Quilt Symposium hosted by the Asheville Quilters’ Guild. 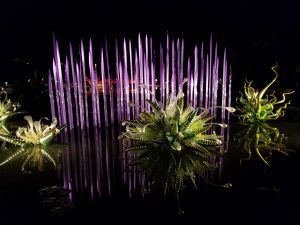 During the Symposium, several of us went on a tour of Chihuly Nights at Biltmore, the first art exhibition in Biltmore’s historic gardens and the first garden exhibition of Chihuly’s works in North Carolina. 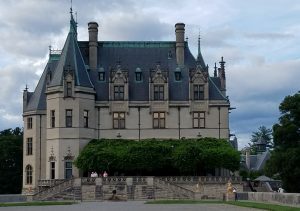 The Biltmore House and gardens is a spectacular estate officially opened by George Vanderbilt on Christmas Eve, 1985. 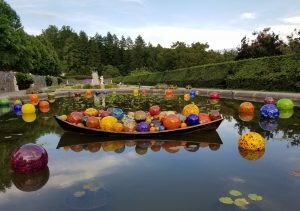 We arrived in time to see the house and gardens with Chuhuly’s colorful organic glass creations in daylight and were then treated to a gorgeous sunset. 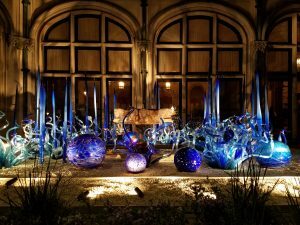 As darkness fell, the glass sculptures were illuminated and took on a a new dimension and vibrancy. Here’s a daylight and night time shot of the same installation. The next two use the existing stone wall and statues and the exterior of the house as backdrops to display these amazing pieces. 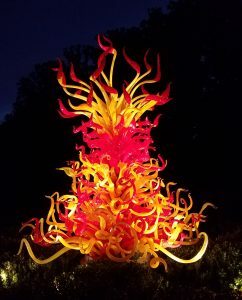 Then follows the Electric Yellow and Deep Coral Tower and the Alabaster and Amber Spire Towers. 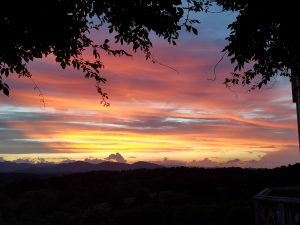 As quilters, we don’t always know what exactly inspires us in our work. 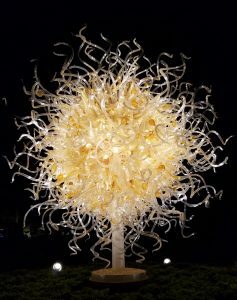 In addition be being enjoyable, taking the opportunity to look at other art forms is always beneficial and adds to our store of experiences from which to draw our ideas. 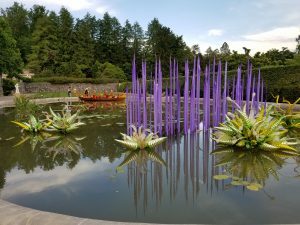 This entry was posted in Travel and tagged Arts, inspiration by Maggie Ball. Bookmark the permalink. 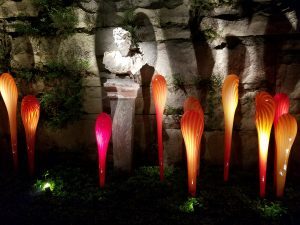 I enjoyed these photos of Chihuly’s work. Coming from his home town, it surprises how far his work travels. Beautiful! Thank you for posting these.